Adolphustown, November 4, 2005 - The U.E.L. Heritage Centre & Park has been granted permission to reproduce The Loyalists (1984) stamp on literature and advertising promoting the celebration of its 50th Anniversary. As part of Ontario's bicentennial celebrations, Canada Post held the commemorative stamp launch at the U.E.L. museum, Adolphustown, on July 3, 1984. The original artwork was designed by Belleville illustrator, William Davies. It depicts refugee Loyalist families with the traditional flag in the background. Loyalists landed at Adolphustown in June 1784. The original landing site and the adjacent cemetery now form the nucleus of Greater Napanee's largest tourist attraction. U.E.L. Heritage Centre & Park will be celebrating its 50th anniversary in 2006. June 17th, 2006 will be the date this year's festival titled Loyalist Landing and Market Days. With 26,000 visits U.E.L. Heritage Centre & Park is the second largest tourism attraction in Lennox and Addington County. In 2005 visitors arrived from throughout Canada, United States and Europe. U.E.L. Heritage Centre & Park is a not-for-profit preservation project of the Bay of Quinte Branch, United Empire Loyalists' Association of Canada. 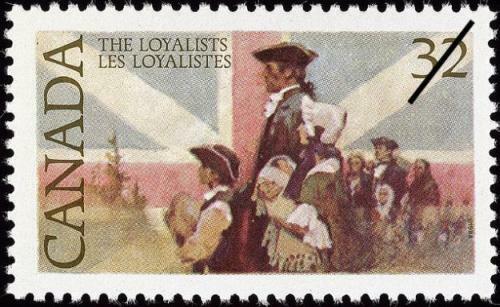 Additional information regarding the 1984 Loyalists stamp can be found at the web site of Library and Archives Canada, Postal Archives (visual search, 1982-1992). The United Empire Loyalist Heritage Centre & Park is an amazing slice of Canadian history on Adolphus Reach of the Bay of Quinte. Here we tell the story of the Loyalist settlers. They came from places like Boston, Philadelphia and Albany to forge a new life in a new nation. For more information, visit uel.ca. On June 26, 1956, as a direct result of the efforts to preserve the Adolphustown 1784 landing site and Loyalist cemetery, the Bay of Quinte Branch began at Adolphustown with twenty-one members and remains one of the larger Branches in the Association.